First, the bad news: The technique you’re using on chips and pitches is wrong. You were probably taught the “body-moves-the-club” method that seems sensible but often results in skulls, chunks and poor touch. The good news? A new, scientifically proven short-game system is sweeping the PGA Tour, and it’s easy for you to learn. 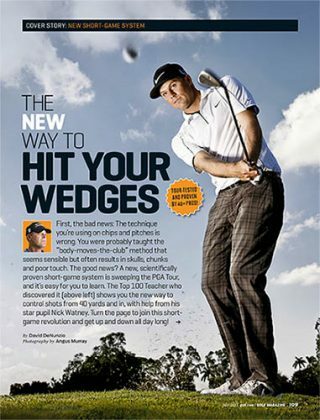 The Top 100 Teacher who discovered it (above left) shows you the new way to control shots from 40 yards and in, with help from his star pupil Nick Watney. Turn the page to join this short-game revolution and get up and down all day long!